This is the first place Chris and I have lived in that’s had a working balcony. When we first started dating, neither of our places had balconies (although Chris’ did have a pretty nice roof top patio for the whole building to enjoy). Our first apartment was constantly under renovations, and we hardly ventured out on to that balcony at all. So when Walmart Canada asked me to take the Frugal Heroes Challenge, I pretty much knew I wanted to use the $100 to make my balcony as pretty as the view from it. 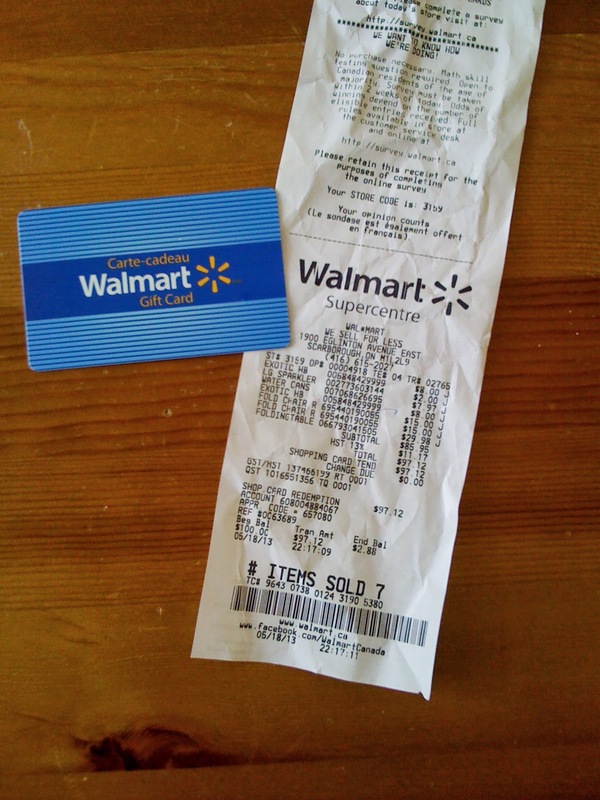 My closest Walmart is a Superstore less than a five-minute drive from my house. It’s open from 7 a.m. to 11 p.m. and pretty much always busy. Chris and I saw chairs we liked in the weekly flyer, and I headed out alone to make the purchases one Saturday night (although I called Chris multiple times to check in with him to make sure he was OK with my decisions). Good thing too, because I packed the shopping cart – poor Hannah would have had no place to sit and wave to fellow patrons (her favourite past-time when shopping with her family). The Garden Centre was laid out well, and even though I made my trip in the evening, where the flowers are housed was lit up well enough that I could easily see all the flowers and their gorgeous colouring. I decided on two red Impatience hanging flowers – mostly because the tags say they are low maintenance and last the spring, summer and fall. And because I found red ones – and red is Chris’ AND Hannah’s favourite colour. I also spent some time in the seasonal section, checking out the swimming items and summer toys – but decided that at 15 months Hannah wasn’t quite old enough for sidewalk chalk or Ninja Turtle Bowling (even if I consider myself still “young” enough for both of those items). The total came to $97.12. I couldn’t be more pleased with my new balcony. Everything was really easy to set up – we literally just took off the wrapping, and unfolded the table and the chairs. I love that all the furniture folds down – it will make it easier to store come winter. So here's the big makeover reveal! If you had $100 to spend at Walmart, what would you buy? Your patio update looks great! I love the choice of red. It really brightens it up! If I had $100 to spend I would spruce-up our home office. It's the one room in our house that I don't like using because it's not organized the way that I would want it to be. My husband is the only one who uses it. I would buy a few hanging baskets for the patio. Love seeing pops of red patio decor. You did good decorating your patio for $100. Hmmm what would I do with $100 at Walmart - probably by some containers and boxes and organize the linen closet, kitchen cupboards and under the bathroom sink! It's just piles and piles of mess in all the closets and cupboards.